More than 200,000 metropolitan Phoenix residents call Glendale home. It's about nine miles northwest of downtown Phoenix but has a history all its own. It traces its roots to its founding in 1891 as a temperance colony by William John Murphy and Burgess Hadsell. The building of a railroad that connected it to Phoenix shortly after the town was founded spurred settlement, and the ban on alcoholic beverages was a draw for some settlers. The Glendale Civic Center, Murphy Park, and Caitlin Court, known best for its antique stores and unusual shops, are all in downtown Glendale, along with the Glendale Visitor's Center. Old Towne Glendale is especially fun at night, with gaslights lighting the way to its ethnic restaurants. 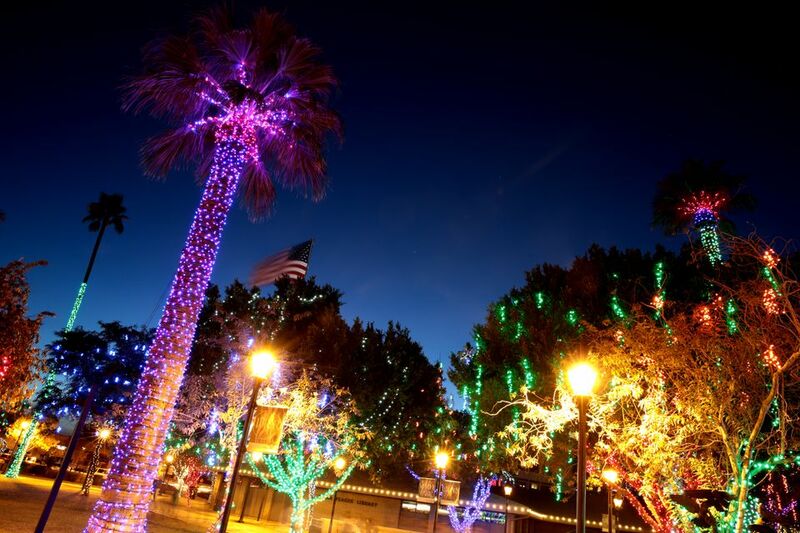 Some of the most popular events and activities that take place in Historic Downtown Glendale include the Front Porch Festival at Caitlin Court, Teddy Bear Day, Christmas in July in Old Towne and free Glendale summer band concerts at Murphy Park. In December, thousands of people visit downtown Glendale for several weekends of holiday events, including the annual Hometown Christmas Parade and Glendale Glitters, a holiday extravaganza of 1.5 million lights covering 16 blocks of downtown Glendale. In early February, before Valentine's Day, locals and tourists alike flock to Murphy Park for the annual Glendale Chocolate Affaire. For lunch, dinner, or just drinks and appetizers, stop into one of these restaurants in downtown Glendale. Haus Murphy's of Glendale: German cuisine is what this place is all about. Schnitzels, sausages, roulade, beer, and schnapps are all on the menu. Eat in the biergarten if the weather's nice. Hop Stop Diner: If you're looking for sandwiches, burgers, salads, coffee, or ice cream, stop into the Hop Stop. You'll find lots of options in each category, along with affordable prices. Desert Rose Pizza & Gastropub: Stop into the Desert Rose for some great pizza and upscale pub food with a sports bar ambiance. From the Northwest: Take Loop 101 (Agua Fria) south to Glendale Avenue. Make a left (east) on Glendale Avenue. Take Glendale Avenue to 58th Avenue. Glenn Drive is one block north of Glendale Avenue. From the North: Take Interstate 17 South to the Glendale Avenue exit. Make a right (west) on Glendale Avenue and go straight to 58th Avenue. Glenn Drive is one block north of Glendale Avenue. From the East: Take the Loop 202 East to I-10 West to I-17 North. Exit on Glendale Avenue and make a left (west). Go straight to 58th Avenue. Glenn Drive is one block north of Glendale Avenue. This location is not accessible by METRO Light Rail. Here is downtown Glendale on a Google map. From there you can zoom in and out, get driving directions if you need more specifics than mentioned here, and see what else is nearby.